A group of men hunt for a killer shark that's attacking a seaside community. Universal’s 25th Anniversary Collector’s Edition of Jaws will revitalise even the most jaded palette, with a sharp new letterboxed transfer (2.35:1, enhanced for 16:9), and a thrilling new Dolby Digital 5.1 sound mix. The disc also gathers together a collection of bonus material that even seems likely to captivate those who have little interest in how movies are created. The star feature is a fifty-minute Making of… documentary, (scandalously boiled down from almost two hours worth of material that was on the NTSC laserdisc box set), featuring interviews with cast and crew. There are also a handful of deleted scenes (totalling about ten minutes, with precious few clues to put them in context), a couple of outtakes, trailers, an extensive photos and storyboards gallery, and a clutter of useless text-based fillers. 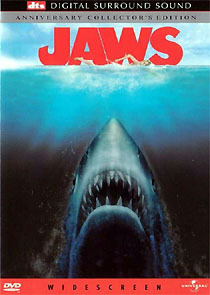 It’s a fabulous disc, but Jaws is a film that truly deserved better supplements, and more of them. The disc yearns for a commentary track or two, and the edited documentary has lost a great deal of interesting material, (which could have been further augmented with material from the BBC’s own excellent Making of documentary). It seems likely that Universal will reissue the film with a more ambitious package for the film’s 30th anniversary (especially since two-disc Special Edition sets have become commonplace since Jaws was released). Until then, collectors and fans will have to be satisfied with this fine disc. There are few differences between the UK and US discs, but nothing that makes one worth choosing over the other. The US does have a variant version, however, with DTS sound. The film’s new sound mix adds considerable breadth to the film, (and especially to John Williams’ unforgettable music), but lacks the range to test either format. The DTS mix has better clarity, but the differences are not striking.